First and foremost, it should be noted that we have no right or entitlement to ask the Govt. 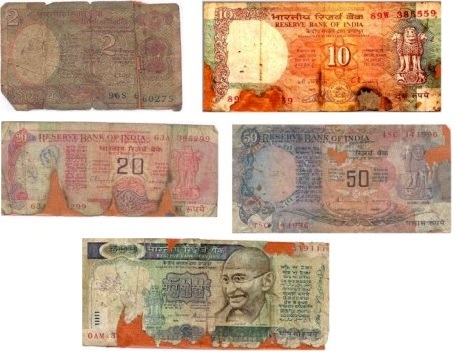 of India or the RBI to replace any damaged currency note or banknote. It is only as a matter of grace that RBI does exchange soiled, mutilated or imperfect banknotes (for the full or half value, as per the prescribed terms and conditions)... the idea being to mitigate the general public's hardship in genuine cases. Accordingly, RBI has issued instructions to all the banks on providing the facility for exchange of notes and coins, as enumerated below. All bank branches should (a) issue fresh or good quality banknotes and coins of all denominations, (b) exchange soiled, defective or mutilated notes, (c) accept all coins and notes for transaction or exchange and (d) notes / coins of small denominations should not be refused. This should be done proactively so that people don't have to visit RBI for the purpose. Further, this facility should be provided to all members of the public without any discrimination. Lastly, banks should widely publicize the availability of such a facility. A ‘soiled note’ has been defined as one "that has become dirty due to normal wear and tear and also includes a two piece note pasted together wherein both the pieces presented belong to the same note and form the entire note with no essential feature missing". Banks should accept such notes over the counter and give appropriate credit to the customer. Of course, banks cannot reissue the same. Instead, they have to be sent to RBI as soiled note remittances for further processing. These are defined as those "where a portion is missing or which is composed of more than two pieces". Such notes are accepted, exchanged and adjudicated in accordance with Reserve Bank of India (Note Refund) Rules 2009. For more information on the same, read my blog post 'How to exchange damaged bank notes'. Bank branches will not acccept or exchange notes that are extremely brittle or are badly burnt, charred or inseparably stuck up together and, therefore, cannot withstand normal handling. Poeple holding such notes have to tender them to the RBI, where they will be adjudicated under a Special Procedure. Banks should exchange up to 20 notes with maximum value of Rs.5000 per day, over the counter free of cost. If the number of notes exceed 20 or Rs.5000 in value, banks can receive the same but credit the customer later after the due process. Plus, they can levy service charges as per the rules. If the number of notes is 5 or less, banks can exchange such notes as per the prescribed rules. Or, in case of doubt, such notes should be forwarded to currency chest branches for adjudication and 'electronically' credit the customer thereafter (within a maximum of 30 days). Person tendering more than 5 notes should be advised to visit the nearest currency chest branch for such exchange. All notes with "with slogans and message of a political nature written across it" or "disfigured notes" shall cease to be a legal tender. Accordingly, all claims for exchange of such notes will be rejected as per the rules specified under Reserve Bank of India (Note Refund) Rules, 2009. All notes that are "deliberately cut, torn, altered or tampered with", too shall be rejected if presented for exchange. When large number of such notes are tendered, the matter should be reported to the Deputy/General Manager, Issue Department and also the local police. The 'Prescribed Officer' at the bank branch, who adjudicates the mutilated notes for exchange, should put a PAY / PAID / REJECT stamp on the banknote, along with his initials and name of the bank / branch. Further, to avoid misuse, such notes should be held by him under his custody. Damaged currency note with 'PAY' / 'PAID' / 'REJECT' stamp shall not be exchanged if presented for payment. Since the value for the same has alreay been paid, as evident from the stamp, the same cannot be exchanged / paid again. Banks should be careful not to reissue such notes bearing PAY/ PAID / REJECT stamps to general public. Further, customers should be warned not to accept such notes from any bank or anybody else. For the information of the general public, all branches of banks have to put up and display a board stating "SOILED / MUTILATED NOTES ARE ACCEPTED AND EXCHANGED HERE" at a prominent place within the bank premises. This, in a nutshell, is the procedure laid down by the Reserve Bank of India for providing the facility for exchange of currency notes and coins.